Irish Dance tunes, with their evocative modes, engaging ornamentation, and rhythmic variety, make great flatpicking pieces, offering a wealth of exciting material with which to broaden horizons and deepen roots. 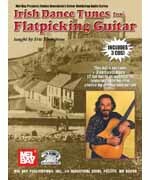 Pioneer flatpicker Eric Thompson has been fascinated with this repertoire for a long time, and was fortunate to perform with master Irish musicians in the 1970's in both San Francisco and the west of Ireland, including the legendary Joe Cooley. Here Eric teaches several of his favorite jigs, reels and hornpipes, and coaches you in the triplets, grace notes, and nuances that give Irish Celtic music its lilt and feeling. All in standard notation and TAB with three audio CDs included.